Bio: Susan Ogilvie was born in Los Angeles, California in 1950. While living in San Diego, California, she attended San Diego State University where she took classes in figure studies and while attending San Diego Mesa College she took classes in drawing, painting and ceramics. In 1987, Susan began her career of exhibiting in galleries by showing her work in the Brushworks Gallery in San Diego, California. 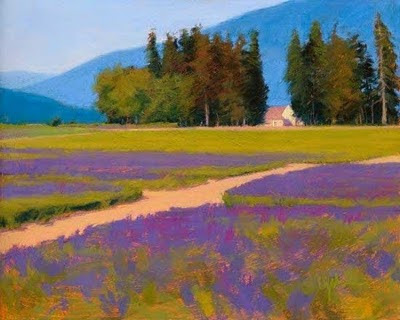 She is a Signature member of the Pastel Society of America since 1991 and the Northwest Pastel Society, Seattle since 1993. Susan has been a juror, instructor and lecturer for many years - Susan juried the Landscapes and Interiors category for The Pastel Journal’s 9th Annual Pastel 100 Competition. Navigation: Main menu remains available on left. The site is up to date. Gallery: Portfolio: All; Originals; Limited Editions; Open Editions. The first two galleries contain identical entries - 24 images in all. The latter two are empty, as is Archive. The website is powered by FineArtStudioOnline.com, a service used by Bill James, Gil Dellinger and Susan Williamson, among others. It seems to be a customisable, off the peg service that has a standard layout; some artists don’t make use of all the options on offer, hence the empty links (Dellinger has no blog, Ogilvie does). Image View: Each gallery page contains thumbnails with data on size and medium displayed if you rest the cursor on the image. Thumbnails enlarge in slideshow and may be further enlarged in pop-up window. Valley Iris is 550x440, 186 KB. Demo: Effectively yes, as Susan follows the development of work on her blog.